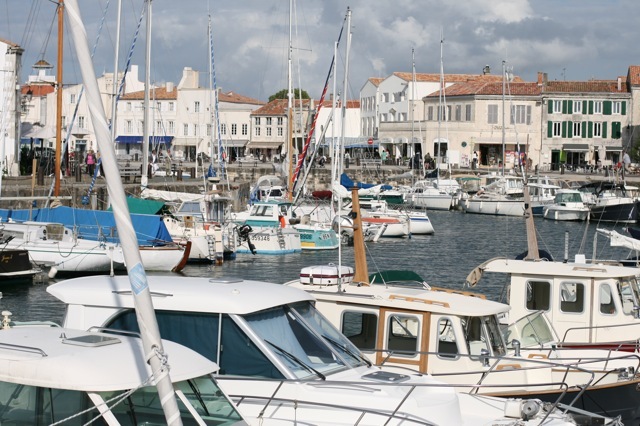 Around ten villages are dotted across Ile de Ré, some little more than hamlets. The liveliest villages are St Martin de Ré (the capital, pictured above), La Flotte and Ars en Ré. The north coast is rocky, a windy beach lines the south. The lively port of La Rochelle is just over the bridge and well worth paying the extra toll to leave the island during your stay. We have holidayed on L’Ile de Ré for ten years. Long before salt caramel was fashionable we were enjoying fleur du sel ice creams and boiled sweets here. More gastronomic are the local oysters and seafood, best quaffed down at sunset with a glass of Pineau or some rosé wine. It stays light very late here – until 10.45pm on clear evenings in early June. During half term, we escaped the miserable jubilee weather and headed to Camping des Ilates to stay in a Eurocamp mobile home. Our trip began with hideous traffic out of London to scrape onto our Dover ferry at the last moment contrasted by a speedy French motorway journey covering 400 miles in a day. Being on the Atlantic coast exposes you to whatever the ocean throws at you – my husband jokes that the second we cross the toll bridge onto Ré that it starts to rain. The changeable weather is a warmer version of Scotland with several seasons in one day. Fortunately we had plenty of sunshine with only intermittent showers. My favourite activities on the island are visiting the food market at La Flotte, looking around the (quite upmarket!) shops and eating seafood by the harbour in St Martin de Ré. Our favourite restaurant there, which I’ve previously written about on here is Skipper. Our holiday parc was Camping des Ilates in Loix, one of the smaller villages on the island (Loix village centre pictured above). There are a few shops and services here, a small daily market, tea room, cheese monger, bar/tabac, butcher, baker, creperie and supermarket. Loix can be very sleepy when the shops are closed as we discovered on Saturday evening and Monday daytime. Our mobile home had three bedrooms, a raised deck area and separate WC and bathroom facilities. Equipment included a gas barbecue, full size fridge freezer and gas cooker. Laundry facilities were also available onsite as were a shop, bar and restaurant if you didn’t feel like cooking. A lot of sporting facilities are packed onto a small holiday parc site – tennis, beach volley ball, swimming pool and bike hire. The Eurocamp caravan also has a selection of books, toys and games to borrow. Check out Ted’s video review of our mobile home – a career as an estate agent or TV presenter awaits! Large mobile home with plenty of living space so that we didn’t feel cooped up if rain kept us indoors (fortunately only twice in a week of mixed weather). Great cooking facilities – having a proper oven is a bonus in France since many apartment holiday chains only provide kitchenettes with electric hobs and a mini oven. In our mobile home we had a generously sized fridge freezer, gas cooker and hobs, worktop space to prepare food on, cupboard space for our provisions, adequate kitchen equipment and serving dishes, plates etc. “En-suite” bathroom to main bedroom. Well ok, it’s not private en-suite but having that extra door from mum and dad’s bedroom to the bathroom was very handy for moving from the shower to bedroom so you don’t risk flashing at the family opposite. Spacious decked area. My favourite thing about the deck is that you can walk in and out of the mobile home with food and plates without going up and down any steps. Gas barbecue. It was great not to have to buy charcoal! Swimming pool, there was a good sized pool with adjacent paddling pool and jacuzzi. There were plenty of umbrellas which is always a plus when you’re as prone to sunburn as me. On site bike hire. We didn’t use this but there were plenty of bikes available to hire. Eurocamp Couriers – John and Esther were never far away if you needed anything and regularly circuiting the parc on their bikes to check everyone was having a good time. On site cafe – freshly decorated, bright and cheerful. Free wifi. Having stayed at other sites where wifi is charged by the hour or you buy an expensive pass for the week only to find it doesn’t work properly, it was a joy to have wifi reliable enough to make Skype calls home. Easy parking. I love being able to park the car right next to the mobile home, it makes loading and unloading so easy. One of our previous Ile de Ré holidays was with Pierre et Vacances where you had a very long walk across bumpy gravel from your apartment to the car. Seamless journey. Eurocamp also book ferry crossings meaning you can pack your car at home and go direct to your destination without sitting about in an airport. Being in a remote location. Camping des Ilates is on an uninteresting piece of coast surrounded by marshy fields. The village in Loix is a good fifteen minute walk away although would be nearer by bike. Loix itself one of the smallest villages on Ile de Ré and is nearly fifteen minute drive from the nearest other village. There just wasn’t enough going on for us, we prefer people watching with shops and restaurants to gad about in. Nearby St Martin de Ré or La Flotte would have suited us better. Very quiet small site. There wasn’t any entertainment in the evenings but there were not enough people staying to sustain it anyway. Although it was half term, the sections of the park looked after by other companies (around 75% of the area) seemed empty. We walked past another Eurocamp site on the island near Le Bois Plage en Ré and observed there was a kids club running, a nearby sandy beach with bars and cafes. There was generally a lot more going on around the other site. I am however informed that in high season Camping des Ilates holds karaoke nights. The play area at Ilates was just about adequate for a ten minute diversion but had a broken swing. There was a decent slide, beach volleyball and tennis courts but with few people using the facilities the parc lacked excitement. Lack of swimming pool slides etc. We would prefer a parc with some slides or tubes into the pool. Cardboard pizza from the onsite cafe. The French are never very good at Italian food so cardboard pizzas in France are by no means unique to here. With thanks to Eurocamp for accommodation and travel.